The steam turbine is made up of hundreds of angled blades mounted in rows on a rotating shaft. When steam from the boiler enters the turbine, it hits these blades and causes the shaft to turn rapidly at 3600 rpm. Between each row of moving blades is a row of stationary blades which redirect the steam flow onto the next row of moving blades. 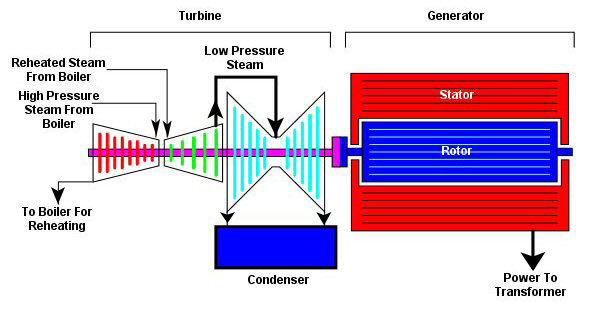 As the steam passes through the turbine, energy is removed from the steam causing it to lose pressure and cool off. The steam exhausts from the turbine at a very low pressure, and is changed back into water in the condenser. The generator consists of two main parts: the rotor (which turns); and the stator (which is fixed). The rotor carries a magnetic field which rotates as the rotor turns within the stator. This causes electrical current to be generated in copper coils in the stator. The energy flows from the generator to a transformer where the voltage is increased before sending the power out to the customer. Great historical information on steam turbines, with lots of pictures, includes electricity generation, dynamos and steam turbines.